I've been in a quandary where to start and have decided to start with the best - pink pearls. It's been very windy recently. It still is. Windy and rainy with sudden and torrential buckets-tipping-from-the-sky downpours so there are lots of branches on the paths. It used to be that trees fell down when it was windy like this but weak ones have been felled over the last few years and iffy branches lopped. In some places, the land now seems bare but little trees have been planted to fill some of the gaps and the skyline will turn green again one day. .people click the picture - but in this case - well do! Meanwhile the wind must take something and it's tugging down bush sized branches with lots of twigs sticking out, and long, thin, straight branches too. It was on one of these that I found the pearls. They weren't there three days ago. I photographed them yesterday. They will be changed or gone by tomorrow. I'd been walking along with Ming (Esther's husband) the day before, when we came across one of these long, thin branches. It was about fifteen feet long and barely more than an inch thick - and lying across the path so Ming picked it up (of course he did, it's what males do) swung it around a bit and tossed it to the side. Just as he let it go, I saw a pink toadstool right by his fingers. I jumped around a bit, exhorting him to wipe his hand on his trousers and not to put his fingers near his mouth. Toadstools strike almost unlimited precaution in me. Friends have grown tired of my camera. Sometimes, I am forced to leave it at home before they will go a step. Never mind - I went back yesterday. There must be something very enticing about this particular branch / stick because it had been moved again in the meantime. But I found it. The weather is windy, the weather is wet but the weather is also warm. See how the baby nettles have already begun to cover it? Fungi grow fast. See the little pearls? Presumably these will soon be toadstools like the one in the picture. When I say 'big' I mean no more than half an inch high. It looks even smaller and flatter because of the angle but I try not to move anything when I photograph. Hardly ever will I even brush a blade of grass away from the lens. You get it how it is or you don't get it at all. And I'm counting us lucky that we are seeing it. If it weren't for the wind, the branch with its little pink toadstool and pearls would still be stuck high in a tree and while I may clamber up banks or paddle in ditches for the sake of this blog . . . I haven't gone tree climbing yet. I'll go back though. Not till Monday at the earliest. But I will go back. And if I can find it despite growing nettles and men and boys who can't pass such a light, long branch without waving it around - we'll see what happens to pink pearls when left in the woods to grow. There's another problem. Shortly before I arrived at the branch I'd passed a woman with an elderly border collie going in the other direction. Shortly after I'd left it I heard her shout 'Put it down!'. Her dog (a very nice looking one) had run back to see what I'd been looking at, clearly wondering if it would be of similar interest to him. Clearly it was. Clearly he doesn't share my compunction over disturbing evidence. Clearly he does, nevertheless, have a good eye for sticks. Keep your fingers crossed. P.S. There are lots more fungi to come in the next few posts. P.P.S. Because I know nothing about fungi, I make up names. This one, I'm calling 'Pink Cup Fungus' but I'm wary in case that is already the proper name of a different version. Therefore, I'll call it Cuppus Pinkus Fungus. It doesn't fit the way one is supposed to name plants so that will show a.) that is isn't really its name and b.) that I don't know what I'm talking about. There's a difference between observing and informing. This is an observing blog - not a well informed one! P.P.S. Here's me waffling on - and I've found a wonderful fungi site which is, though not authoritative (it emphasises there may be miss-identifications so it should be treated with caution) is, to my mind . . . brilliant. It's called Visual Fungi. Like mine, it is area based - but not here (South Dorset). It's further east (East and West Sussex). This is good because it leaves me with a feeling I'm doing something useful after all. Different terrain. Different fungi. And if there is an overlap, that is good too because it's interesting. For those who are not familiar with the geography of England, Sussex is far enough away for the terrain to be different but near enough for the climate to be roughly similar. I'll tell you something else about it too - not only has it got a sophisticated system for finding fungi on the site (by name, month, type, location, edibility!) each time you click the title on the home page the text pops up the same but the illustrations change. I wish I knew how to do that! The pink pearls are truly fungtastic! How? Would that be something like plumbing in a slide show? Ask someone, not me, who has it on their blog. The Visual Fungi site looks very interesting. I like that you can search by month. I wonder what your little pink pearls will turn into. Assuming the evidence site doesn't disappear somehow. You asked on my blog about planting poppies. The soil here is sandy loam, very soft. When I pull summer annuals, like Madagascar periwinkles, it loosens the beds just enough to receive poppy and larkspur seeds, or whatever I'm planting. I try not to let gardening be more difficult than it must. 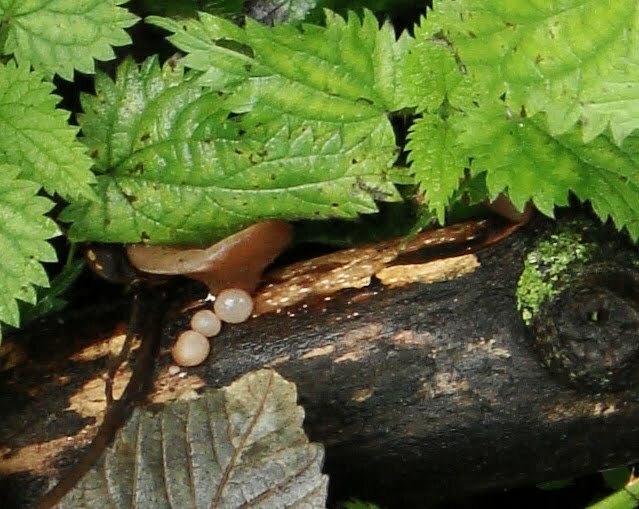 I've never seen the pink pearls before, but many strange fungi grow around here. Mostly I just live and let live with them. Sometimes I disturb the stinkhorns so the buzzards will stop circling overhead. I expect it's possible to find out how it's done. (Sure it is!) But my question is more in wonder than in really needing to know. It's a brilliant device for a home page but could be a bit disconcerting for readers if the pictures within a post changed. That's an idea . . . It might be fun to know how to do it for April Fool's Day . . . magically to transform mushrooms to naked ladies or steam trains. Thanks for the answer about poppies. I think that may mean we do need to wait here because the ground is poor and heavy, easily compacted. I once grew larkspur too - but got fed up with it in the end because, pretty though it is, it couldn't restrain itself from leaping into every available (or not available) place. It made the garden look strangely fuzzy. Oh, Noelle, I'm amazed that you could ever have found them boring. They are like an alien life form on earth, not following what I would think of as an 'ordinary' cycle. Their power is massive. They are like iceburgs in that they sometimes have an underground, hidden side which far outweighs what we can easily see. Their speed of growth is like something out of science fiction - as can be their speed of spread and reproduction. The variety of weird shapes reminds me of cacti and their colours are artistically stunning. There's a spice of danger . . . a hint of survival. A 'now you see it, now you don't' magic about them and then there's the way many spring up just when everything else, leaves, branches, plants, seem to be falling down so, even though they survive on decay, they are a kind of symbol of new growth and Spring itself. They bring nutrients from that decay back into the eco-system so efficiently that some grow symbiotically with trees and yet, despite all that, they are fussy where they live. And I suspect that's just the beginning of the list! I'd not seen pearls like these before. It would be funny if they grew into something very common and ordinary. I remember getting very excited about tiny spiders with yellow stripes which rushed together and formed a ball if their web was disturbed . . . only to discover they were Common Garden Spiders - but I'd never seen them in that stage of life before! I felt very silly.